The Old Clare Hotel rests on a parcel of land that is rich in history, its earliest recorded inhabitants being the Eora people. In 1810, Major George Druitt was granted 8 acres of land wherein Old Clare now stands – at that time, the area was the outskirts of Sydney. Major Druitt sold a large portion of this to John Tooth in 1834, who established the Kent Brewery. John’s namesake ‘Tooth’s Beer’ produced dozens of iconic pub posters that still adorn the art deco pubs in Sydney. Other beers produced by ‘Tooth & Co.’ include KB Lager, Kent Old Brown, and the currently resurgent Resch’s (the Australian equivalent to Pabst). Many who grew up in Sydney still have fond childhood memories of alighting a train at Central Station to the smells of beer brewing at nearby Kent Brewery. Subsequent incarnations of the corner site include an (undisclosed) shop (nothing mischievous), a hay and corn dealer, a produce store (with several owner occupiers), a furniture dealer, a boot maker, and a restaurant. In 1939, the shop building was demolished during the widening of Parramatta Road to create Broadway Street. Architect Sidney Warden was a hot property after designing the nearby Broadway Hotel to much acclaim, so when Margaret Moloney bought the site she hired him to design a new hotel in the “Inter-war Functionalist style”. The pub was similarly praised upon its opening, and Margaret named her new establishment after her birthplace in County Clare, Ireland. 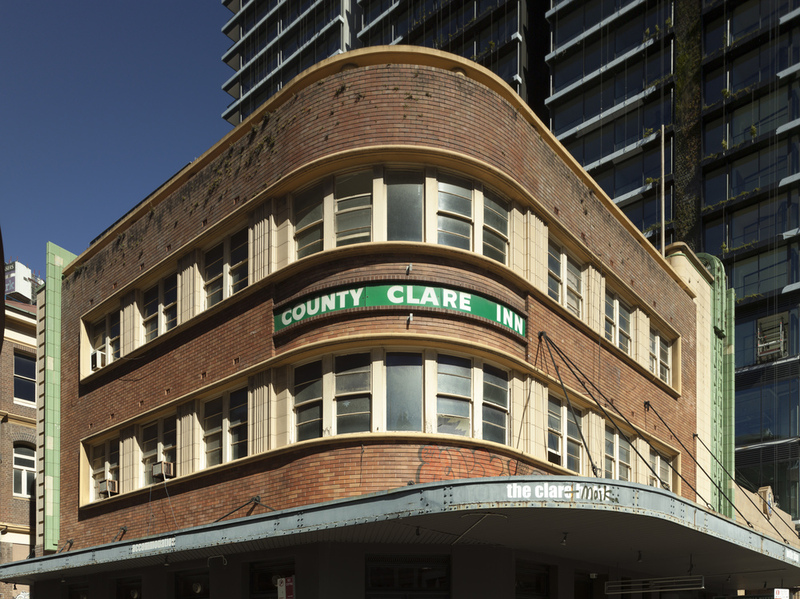 The Clare Hotel was born.